Partnership should net global enterprises improved performance of voice and video calling over long distances. The coming together of software-defined WANs and UCaaS services has been making quite a bit of noise recently. In late September, for example, 8x8 and Aryaka announced a strategic alliance aimed at improving the quality of voice and video communications for global organizations. The rise of UCaaS has been well documented on this site over the past several years, and many enterprises are buying almost all of their collaboration tools from the cloud now. This is particularly the case with audio, video, and Web conferencing services, as shown in results of No Jitter's recently published "2017 Cloud Communications Survey." This shift to cloud communications services poses some interesting challenges for enterprise organizations, particularly if they're global. Businesses that use the cloud often have to rely on the Internet to transport the data, raising the age-old question, "Can the Internet support multimedia traffic as well as a private network can support it? For short distances or even cross country, the difference between sending multimedia traffic over the Internet vs. a private network should be negligible, assuming the Internet connection isn't a low-end crappy connection from some Tier 4 operator. However, with global connections, distance is a factor. 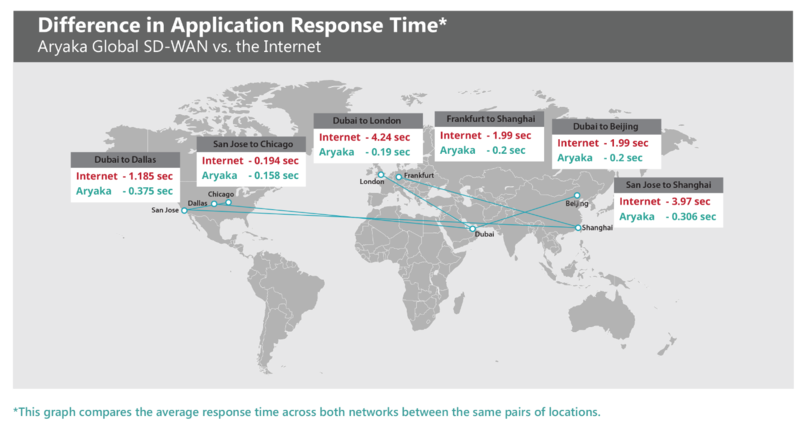 In its recently published "State of SD-WAN Connectivity" report, Aryaka shows that response times for long-distance transmissions do suffer over the Internet. For example, the response time in sending a 100-KB file from San Jose to Shanghai on Aryaka's global private network is 0.306 seconds. This compares to 3.97 seconds across the Internet. That's why Aryaka, unlike most SD-WAN vendors, opted not to leverage the Internet. Rather, it carries traffic over its global private network, which comprises 28 points of presence; 95% of its customers' locations are within 30 milliseconds of the closest node. This makes Aryaka's SD-WAN an ideal solution for global companies. As an industry, we often pooh-pooh real-time voice and video communications in favor of "cooler" mediums such as messaging, chat, and social media -- but everyday workers still rely heavily on voice and video calling. As I pointed out previously on No Jitter, we may start our conversations over another medium but often flip back to voice -- and sometimes video -- to finish the conversation. When this occurs, workers need a great quality experience. Through this partnership, 8x8 can provide high-quality, enterprise-grade connectivity via the Aryaka global private SD-WAN to improve the delivery of voice and video communications for global organizations. By relying on the Aryaka SD-WAN, 8x8 should realize significant performance improvements for voice and video calling through the reduction of latency, jitter, and packet loss -- all killers for real-time communications. The problem with long-distance Internet connections is that the packets go through many, many hops, with each one introducing a degree of variability. Put enough variable connections together, and that gives rise to a chaotic one. Because the Aryaka network is private, it's more deterministic over long distances compared to the Internet. Also, as part of the partnership, Aryaka will enable enterprises to dedicate and prioritize bandwidth for 8x8's Virtual Office (UCaaS) and Virtual Contact Center solutions. The prioritization will enable them to maximize uptime while minimizing service interruptions and dropped calls. The growth in UCaaS has primarily been in the midmarket and below, but large enterprises are starting to warm up to the cloud as a viable alternative to on-premises infrastructure. IT leaders need to keep in mind that cloud success is dependent on the network, and using "best effort" transport may not be "good enough" to support global business needs. Aryaka and 8x8 provide an excellent, bundled solution to ensure that global organizations can shift to the cloud, while minimizing the risks associated with Internet-based connectivity.